After staving off hypothermia the previous night, we were on our way the third day with wet socks and jackets flapping from our packs. Again the Northern Loop presented us with a challenge…after Yellowstone Cliffs is perhaps the steepest part of the trail. We now had to descend 3000 feet in 2.8 miles…my poor knees. We forged on down endless switchbacks. It was truly beautiful forest, although I had to walk slowly (and often sideways). Finally we reached the bottom…Carbon River (2700 ft). We followed the river for another mile until we reached the suspension bridge across the river. At this point the Northern Loop joins the Wonderland Trail and follows it back to Sunrise. 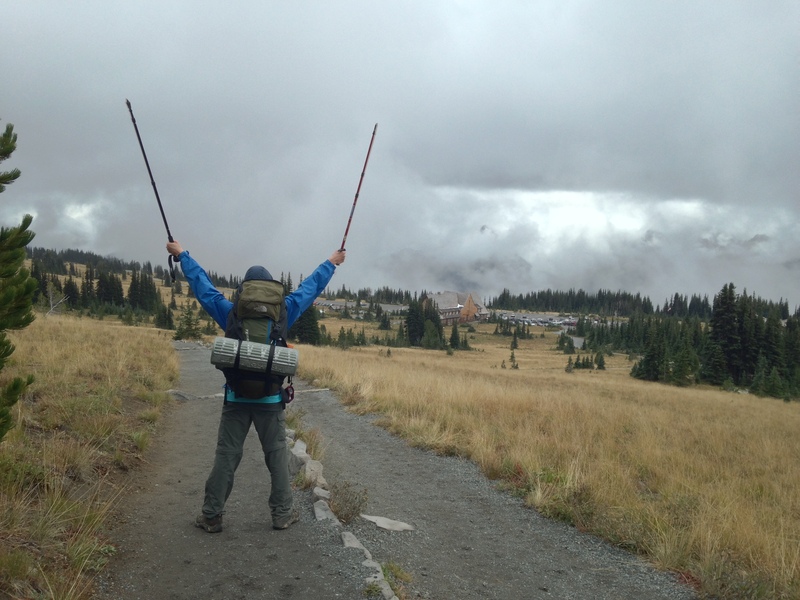 The Wonderland Trail is a magnificent 93 mile loop around Mt. Rainier. Definitely on the ole’ bucket list. We passed a couple of women on day 6 of hiking the Wonderland Trail. The weather before our previous two wet days had been even wetter, and all those hikers wanted to know was…did we know the weather report? I told them that the sun was supposed to come out that day and the next. As wet as we were…they were wetter. We actually passed several groups of backpackers over the four days and the conversation was always the same. Do you think the sun will come out? We told one Northern Trail duo about the snow they would encounter at Windy Gap. They told us about the 4 inches of snow at Mystic Lake Camp…where we were staying that night. Good grief. After a nice break at Carbon River, we headed out. Still cloudy and cool…no sun. We now had, yes, another 3000 foot climb to our next camp. Most of it was over the next mile or two, but we had nearly 5 miles still to hike. The next mile was very difficult, and it rained a bit, but the climb was redeemed somewhat because we were on a ridge overlooking the Carbon Glacier. It is the lowest US glacier, and the longest (5.7 miles) and thickest (700 feet) outside of Alaska. And the first one I had ever seen. So that kept our minds somewhat off of our calves/knees/thighs. Also, the Carbon River originates at the base of the glacier as it is constantly melting underneath while it constantly grows at the top. Pretty cool. Another climb and then a couple miles in Moraine park. Full of rocks and boulders from a previous Glacier. Moraine Creek that runs through it is really beautiful. We also finally got a picture of a marmot. Once again, we saw B&P setting up their tent as we picked out our campsite. With some elation, we saw that the 4 inches of snow we had heard about had melted in the rain…just remnants left on the grass and logs. We each set up our own tent, hurrying before the rain picked up again. We took the time to cook dinner, but I have to say…we were (once again) freezing and it was raining. After our Mountain House lasagnas were ready, we broke back country rules about attracting bears and took our food into our tents to eat. Afterwards, Nathan braved the cold rain to pack up our food and find the bear pole after dinner. Such a great kid. A new problem this night. Even though we still had dry clothes to sleep in, all of our socks were soaking wet. It was in the 30’s and my feet were freezing. About that time we heard a voice outside. “Everyone okay?” It was a ranger, Ranger Paul to be exact, and he was checking on campers. He asked to see our permit, which I found. I unzipped about 5 inches and shoved it through just barely seeing him. I wasn’t willing to freeze for a face to face. I think he wasn’t worried about us camping without a permit as much as he was figuring out who had made it. Turns out, there were 6 parties who had reserved spots at Mystic Lake (it’s on the Wonderland Trail and one of the larger back country sites). We along with B&P were apparently the only two parties crazy enough to still be out on the trail. I accepted that as a badge of perseverance. I told him that besides not having any dry socks we were fine. He suggested sleeping with the wet socks which would dry if not too wet. I tried, but an hour later my feet and socks were still very wet and cold…and now the foot of my bag was wet. I took them off and fell asleep. The next morning we woke to rain. Ranger Paul had said it was supposed to rain until 10 or 11. We waited until 9 or so and broke camp during a brief break in the rain. Once again we packed up wet tents and pulled on wet socks. Nathan went to the creek about 30 yards away to fill up our water bottles. When he returned his face was lit up with a smile. He had seen a bear on the other side of the creek briefly before it disappeared into the woods. I didn’t see it, but the smile on Nathan’s face was enough for me. We packed up and headed out. Our fourth and final day, we had another 10 miles ahead of us. First we descended about a 1000 feet to the base of Garda Falls (extraordinary) skirting around the Winthrop Glacier along the way. I have to say, I found this section to be especially magical. Even though it was cloudy and rainy the whole day and we never could see Mt. 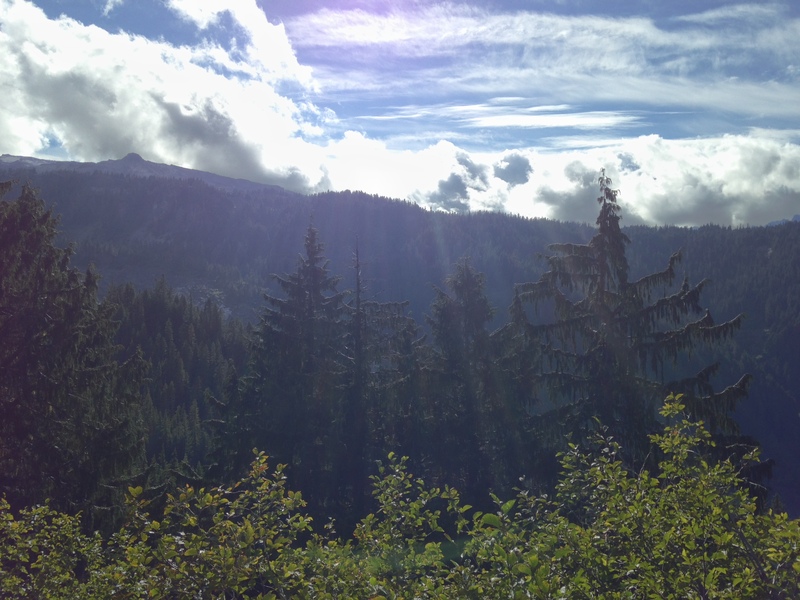 Rainier…the forest was quiet and tranquil. The forest growing up among the boulders quite wonderful. It felt a little Tolkien-ish. After a couple miles, we began our last major climb. From the falls at ~4500 feet we would climb to Skyscraper Pass at over 7000 feet. As we climbed it once again grew colder, raining lightly on us the rest of the day. (No the sun did NOT come out…stupid weather report). And while it didn’t snow on us, we soon found our selves hiking once more through snow and ice, our toes sloshing in our boots again. But it was fine. There is something enchanting about hiking in snow. There were flocks of small birds darting from field to tree. Some snow covered hills had us wishing for skis. And white snow amid the green fir trees is just so pretty. Soon we left the tree line and began the final push to the crest. A bit of blue sky teased us, but we never could see Mt. Rainier. One amazing part of the whole trail was the different terrains that we hiked through. From waterfalls to thick forests, rich valleys to barren mountain tops. After cresting Skyscraper Pass, we headed back down towards the Sourdough Ridge trail that we began on. We were so excited to be back at the beginning…until we realized we still had a couple miles to go. We passed a father and his two kids who were hiking all the way to Mystic that night. The kids were hoping to see snow. Yes I assured them…they would see snow. And as they were wearing jeans and tennis shoes…I wasn’t sure they would be so happy to find it. The end of the hike was hard, we were sore and tired and had not eaten near enough that day. When we finally, joyfully reached the Sunrise Visitor Centor…we quickly ordered two cheeseburgers and ate them. Without having washed our hands in 4 days. And two hours later, driving through Enumclaw, we stopped for bar-b-que and ate two more plates of food. We began…bright eyed. And happy. We finished…cold and tired. But still happy. So we finished…conquered the trail. It was the hardest backpacking trip I have taken, due both to the extreme elevation gains/losses and to the near constant cold rain/snow/sleet. But wow…what a hike. The scenery was sublime. Such an incredible experience to share with my son. But it is the accomplishment of such a challenge that gives such gratification…the cold and the elevation only increased our fulfillment. The mountain beckons us both to return. I’m just now reading this and can’t believe you made it through this hike. Between this and your Alaskan adventure, you guys are so tough! I admire it! I hate the cold so very much so not sure I would have come away so positive.